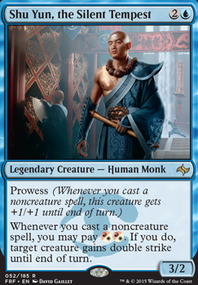 This Voltron Spellslinger Shu Yun, the Silent Tempest EDH Deck. Originally I went all in on the voltron aspect but I dialed back just slightly to have a better multiplayer defense and back up plan in case Shu Yun is too heavily targeted by removal. There is still a TON to protect him but I felt it had a better balance rather than the well you took out one guy and then died on the backswing from the other players who realize they're on a timer before you one-punch them out of the game. It also was more fun IMO. Ideally you want to ramp early with artifacts and play Shu Yun at 4-5 mana. This is so you have additional mana for counterspells and various protection spells. It's heavily meta dependent but usually you want to have up at least one mana to threaten something even if you're bluffing. Being able to for sure connect after going through a chain of noncreatures spells is very important to the deck. There are many forms of evasion in the deck in all the protection spells can be used offensively, 6 different unblockable effects, Leap, Shadow Rift, and bounce effects like Wash out and Cyclonic Rift. So far I've had pretty good success with the deck. It's nice to have a couple of different playstyles to choose from in a given night. Especially true for me when there is a particularly strong archtype in a play group. It keeps the meta from getting too stale and one thing from being too dominate! Hope you enjoy the deck and are able to use it for inspiration for your own decks.